From working with my father in a darkroom as a young boy, to shooting coffee-table-style cookbooks, photography has been part of my life for as long as I remember. These days I mainly shoot for pleasure and occasionally take out the camera for client in need of some commercial photography to accompany a marketing communication project. I have configured some galleries below of a few shots if you are at all curious as to what sort of style I shot with. The photo here, right, was one taken by a photography buddy, Adrian Morgan. 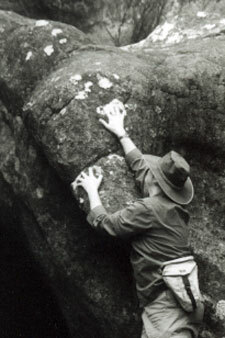 We went on a photography camping trip in the Grampians in the late 90s and this shot shows me scaling Mount Arapilies, near Natimuk. As this page develops over time, I will add more shots from that trip because it was extremely fruitful with beautiful colours, scenes and macro work. For the record, I have been a Canon man most of my photography career and still knock around with my D60 – a great, trusty digital SLR camera that does everything I need it to do. Although I’d like to scale up to more megapixels, at least a few more than six, I believe that once you hit 10 and beyond you start becoming a data storage professional rather than a photographer. PS Sorry if you found this site while searching for a wedding photographer. I do know some excellent photographers in Adelaide and Melbourne and can put you in touch with them if you would like me to recommend a photographer.